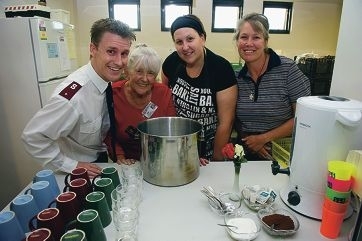 Wanneroo City Council approved the Salvation Army’s application for $1110 on April 30, which will go towards ingredients for weekly Wednesday dinners. Lieutenant Scott Ellery said they started providing dinners towards the end of last year for an eight-week program, but they have continued it because of the need and response. ‘One of the things that we really wanted to make sure that people got was a healthy meal,’ he said. ‘The City of Wanneroo donation will help us immensely as we were having to cover the finances for the food costs ourselves. Lt Ellery said people from Merriwa and surrounding suburbs came to the weekly dinners, which take place from 5.30pm and 7.30pm at their Jenolan Way premises. ‘We get a diverse demographic from the community ” single parent families, retirees, homeless people, young families, and individuals looking for a place to belong,’ he said. Lt Ellery said the next step would be to source funds to upgrade their facilities so they could keep up with demand. To make donations or get more information, call 9305 2131.